We spent Thanksgiving 2008 much like Thanksgiving 2007, at a potluck gathering at Ecology House in San Rafael, California. Ecology House is the only HUD (US Government) low-income housing for people disabled with chemical sensitivities. It has 11 apartments and a community room where residents host events, meetings, and parties. The Environmental Health Network holds its monthly meetings there and they sponsor Thanksgiving, buying the turkey and other basics. 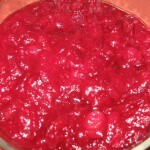 Organic cranberry sauce made with lemon instead of orange. 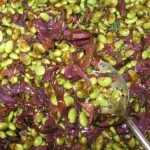 Organic cold salad made with edamame and roasted red cabbage. 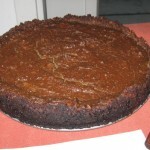 Organic vegan gluten-free pumpkin pie. 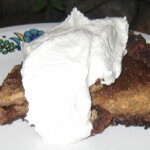 Organic raw vegan cream made from cashews, lemon, stevia, and seasonings.